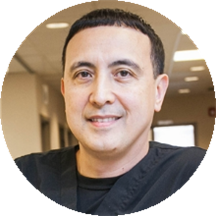 Dr. DaSilva is a highly educated staff physician specializing in urgent care. Since 1996, he has provided care for adult, geriatric, and pediatric patients in both emergency room and ambulatory care clinic settings at St. Vincent’s Hospital, Midtown Health Center, and La Clinica del Barrio in New York. He also served as a clinical instructor and preceptor for the residents and medical students in the Pediatric and Internal Medicine clinics and inpatient wards at Metropolitan Hospital/ New York Medical College. Dr. DaSilva is licensed in both New Jersey and New York, and holds certifications by the American Board of Internal Medicine and the American Board of Pediatrics. He earned a Doctor of Medicine Degree from the Mt. Sinai School of Medicine and a Bachelor’s Degree from S.U.N.Y. at Binghamton. Among his many credentials include DEA and CDS registrations and FMCSA, BLS, PALS, and ACLS certifications. His broad training ranges from CDC concussion and NYS DOH infection control to mandated reporting. Was very disappointed with my visit. First, it is an urgent care facility, although that isn't clear in the description. I would have gone somewhere else if I knew that. Second, I waited at least 90 minutes in the lobby, andthen another 15 in the exam room. Third, once I saw the doctor, he was so rushed that I never got a full sentence in. I don't feel like he listened to the symptoms I described beyond the first or second word. Would not recommend. Wait was a little long but over all service very good. Great visit took under an hour staff was very professional friendly and nice. I went we a last minute appointment and was nervous but everything went well very friendly and efficient would recommend Saturday hours are great too . He was okay, didnt really impress me. He was very pushy and didn't last long in my visit. He didn't know how to explain things well. If you want to be seen for a regular check up id recommend him if its a more complex situation please look elsewhere. Dr. Da Silva was pleasant and did a through job of asking me about my medical history. Everything ran smoothly and I anticipate visiting him again should I need treatment before my next annual physical. It was good. Other than being told at check in that I was supposed to fast for new patient blood work and waiting 35minutes to be brought to an exam room it was routine. The technician was very pleasant and helpedease my frustration with my visit that was overall good. It was fine but the website matched me with a doctor that does not accept my insurance as a primary Doctor only for urgent care. Dr. Robert Da Silva, MD has no appointments on Zocdoc right now.